Imagine it - churches and monasteries perch precariously on cliff tops gazing down onto secluded sandy coves and timeless, untouched villages. Add the spectacular scenery, traditional tavernas, perfumed pine forests, stunning white beaches and warm hospitality, and you have somewhere very special for your holiday. A earthquake in 1953 destroyed most of the buildings in Kefalonia’s 365 villages apart from Fiskardo in the very north. As a result, the whole island had to be rebuilt, Kefalonia is probably the least developed or commercialised of the Ionian Islands although it is the largest and arguably the most beautiful. 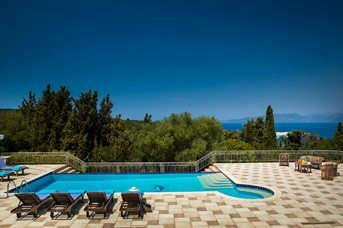 Kefalonia is a peaceful place but not at all dull – perfect if you need a tranquil holiday in the sun. Lots of our villas here have fantastic views as many of the towns and villages were built on hills and mountain tops to avoid invasion in the 1820s and then rebuilt on the same sites after the earthquake of 1953. There are attractive seaside towns and more remote villages deep in the countryside. 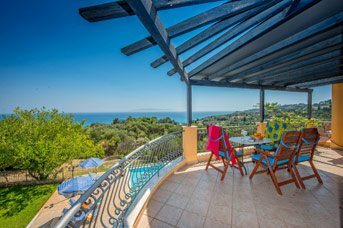 Almost every villa has a sea view! If you want the amenities of a lively town close at hand, you could choose a villa in Fiskardo, which is unique in that most of 18th the century candy-coloured Venetian buildings lining the horseshoe shaped harbour are still intact. The old buildings look particularly fine in the mellow light before sunset, when you are strolling along narrow streets brightened by tumbling cascades of vivid Bougainvillea. The food in the busy, family-run tavernas that line the waterfront tends to be classic Greek fare such as lamb kleftiko and stifado, and of course there is always fresh fish on the menu. If you want the sea but not the crowds, the tiny fishing village Katelios is a great choice as the 2 sand and shingle beaches, Agia Varvara and Agia Barbara are rarely busy. If you are keen on walking, cycling or horse riding, Trapezaki set amongst rugged hills, cypress trees and olive groves makes an ideal base for exploring the lush countryside on paths and trails rather than roads. Our quietest villa is probably in Spartia, an old-school traditional Kefalonian village that is almost untouched by modern tourism. 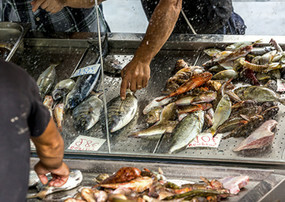 It has a slow pace and the natural rhythms of a small farming and fishing community. Not far away we have villas in Lassi, a purpose-built town with all the right ingredients for a top holiday resort, 2 sandy beaches complete with sun loungers and water sports, lively nightlife and a main street packed with bars and restaurants. Our clients love both places, so it all depends on you – your style and taste, and what kind of holiday you are dreaming of. 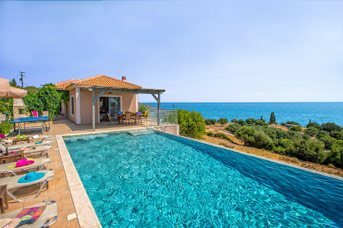 All our villas in Kefalonia are different, and they are all special. The view may vary, but the quality does not. Our philosophy is simple. We want you to be happy. So, lazing by the pool or flying high on jet-skis? A hillside village inland or a man-made holiday resort on the beach? Whatever you go for, we want you to love it, and we are confident that you will. Home to the Hollywood blockbuster, Captain Corelli's Mandolin, this laid-back Greek island is perfect for those seeking stunning scenery! Most of our villas are located in the south of the island. If you’re looking for a holiday with the sea but not the crowds, the tiny fishing village Katelios is a great choice as the 2 sand and shingle beaches, Agia Varvara and Agia Barbara are rarely busy. If you are keen on walking, cycling or horse riding, Trapezaki set amongst rugged hills, cypress trees and olive groves makes an ideal base for exploring the lush countryside on paths and trails rather than roads. Or there’s Skala - once a small fishing village which has grown into a modern seaside town with many restaurants and tavernas lining the main street leading down to the beach. In the North, the harbourside town of Fiskardo is beautiful - the seafront is lined with quaint shops and restaurants overlooking the yachts moored by the water’s edge. Most of 18th century candy-coloured Venetian buildings lining the horseshoe shaped harbour are still intact, which makes the perfect spot to dine by day, or night. The food in the busy, family-run tavernas tends to be classic Greek fare such as lamb kleftiko and stifado, and of course there is always fresh fish on the menu. A picturesque fishing village in the Pyllaros Valley, Agia Efimia is a great base from which to explore the North of Kefalonia. The laid-back feel in Agia Efimia means you can unwind and watch the world go by from this Ionian oasis. With plenty of great tavernas and cafes on the waterfront, an award winning beach and pretty architecture throughout, this resort is a slice of paradise. Fiskardo is a picturesque and beautiful Greek harbour village on the northern tip of Kefalonia, set among rugged hills, cypress trees and olive groves, with wonderful views across the water to the neighbouring islands of Ithaka and Lefkas. 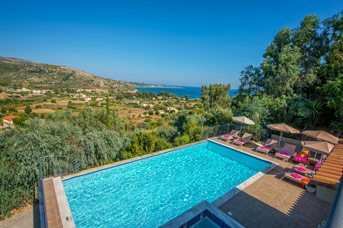 Katelios is a great choice if you want a bit of peace! This tiny fishing village on the South West Coast of Kefalonia between Skala and Lourdas was not much more than an overgrown hamlet until relatively recently. Even now the 2 sand and shingle beaches, Agia Varvara and Agia Barbara are rarely crowded. Like many villages on the island, the main part of this resort, called Lourdata is slightly inland, built to resist coastal raids by maurading pirates. Lordas is the beach part further down. If you are travelling on the main road towards Kefalonia’s capital, Argostoli, you take a sharp left down a winding road down a steep hill. The village is halfway down and the beach and seaside part of the resort is a further trek down the hill after that. Old Skala is a most unusual village with new life growing from the ruins of the original village. There has been a village on the site for centuries, built on a hillside slightly inland as protection against pirate raids. It was called ‘Skala’, the Greek word for stairs because there are rather a lot of them. A pretty town and harbour on the east coast of Kefalonia, Sami is an ideal resort for a relaxing holiday. The charming harbour is lined with a great choice of traditional tavernas overlooking the Ionian sea, with a small shingle beach at one end. Backed by lush pine tree forests, Sami is a top choice for scenery lovers. Nearby Antisamos Beach is one of Greece's most exquisite gems and a filming location for Captain Corelli's Mandolin. Skala is an interesting tale of two halves on the South East tip of Kefalonia. At the bottom of the hill you have a modern Greek seaside town with an excellent Blue Flag beach in a lovely setting. There are lots of hotels and self-catering holiday apartments and plenty of shops, restaurants and bars. Spartia, on the South Coast of the island between the airport and St Thomas, is an old-school traditional Kefalonian village. Not yet very developed for tourists and so almost unspoilt, it has a slow pace and the natural rhythms of a small farming and fishing community. Situated on the South coast of the Island, Svoronata is a sprawling village which has slowly developed into a small resort due to its proximity to 3 sandy beaches. Set on a gentle hillside which slopes down towards the sea, the area is largely flat making it ideal to explore on foot. The countryside around is filled with olive groves and cypress trees and there are magnificent panoramic views from the dramatic green of Mount Ainos to the beautiful blue of the Ionian Ocean. The village was one of the few not completely destroyed by the earthquake of 1953 and many beautiful old buildings survived, including the church of St Nicholas with its imposing bell tower. Although only a short drive from the airport the area is quiet and peaceful, making it popular with couples and families. The village boasts three mini-markets, a handful of tavernas, a couple of bars and a petrol station. For those wanting more exciting nightlife the livelier resort of Lassi is only a 15 minute drive. Nearby are the beaches of Ammes, Ai Helis and Avithos. The capital of Argostoli is just a 20 minute drive away. In recent years a small marina has been built close to the village at Agia Pelagia. Originally a small cove and home to local fishing vessels it has been developed to attract the many passing summer yachts. Trapezaki is relatively new as a holiday destination. Still under the radar of most travel companies, it remains a quiet, largely unspoiled rural area well off the beaten track. 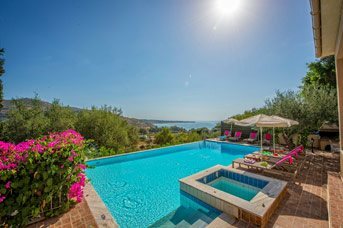 From the foothills of the mountain there are superb views across to the nearby island of Zante. The fine sandy beach here is lined with palm trees offering some shade, and there is usually a gentle breeze that keeps the shore at a comfortable temperature. 'Kefalonia's rich historical, cultural and agricultural heritage have bewitched visitors to her shores for centuries. With a diverse and verdant landscape, many traditional villages and miles of wonderful beaches, and a perfect Mediterranean climate it is easy to see why. There is plenty to see and do on this beautiful island. To simply explore the little villages and countryside along the coast and inland is a delight in itself. There are endless beaches to try out and for the more active or for children there are more modern attractions such as water sports. If you have a real sense of adventure there are also other islands nearby, the Greek mainland and Ithaka. Mount Ainos, which is higher than Ben Nevis, dominates the whole island. The Forest of Ainos has been a National Park since 1962 and is protected by the Greek state. The mountain is covered in a type of fir tree unique to Greece. In the days when the Venetians ruled, this place was called Monte Nero or the black mountain because the Kefalonian Fir trees were so thick and dark - and there used to be more of them! You can actually get right to the topof Mount Ainos by car although the road is very rough and you might be taking a few risks with the suspension if you don’t have a 4-wheel drive. You will know when you have gone as far as you can because there are radio masts at that point. As you can imagine, the view from the top is amazing on a clear day. You can see the whole of Kefalonia, most of Ithaka and parts of Zante, Meganissi and Lefkas as well as Kyllini and the mainland coast, lots of vineyards and herds of goats. Will your camera cope? The best way to fully appreciate this gorgeous coastline with its small secluded bays and beaches, coves and caves is from the water. Why not pack a picnic and be the skipper of your own boat? It can be huge fun, great exercise and gives you a marvellous sense of freedom. You can drop anchor and swim with the fishes in the wonderfully clear waters. Many of the hidden little beaches along the coast can only be reached from the sea. If you arrive byboat, you might have a secret beach all to yourself. You don’t need a driving licence, and will be given all the help you need even if you have no boating experience. This is a brilliant way to explore and escape the crowds. Many of the sandy beaches of Southern Kefalonia were untouched by human development until recently, which suited the Loggerhead Sea Turtles perfectly, giving them a safe place to nest, secluded from the outside world. Not far along the coast is Kaminia Beach, another haven for this increasingly rare creature. It has now been declared a conservation area. Just outside Scala are the interesting ruins of a 3rd century Roman villa which was excavated in 1957 to reveal 3 magnificent, remarkably well preserved mosaic floors. Part of the villa was covered by a church in in the early Christian times. Once the home of a wealthy Roman, it was discovered by accident in 1944 by the owner of the land. You can visit this site free of charge, which you must admit makes a refreshing change! If you are interested in ancient history, you might also like to visit the site of a 7th century temple dedicated to the god Apollo, with the foundation stones and parts of 3 Doric columns clearly visible. You will find the temple 2 miles along the beach road towards Poros. Kefalonia has a remarkable range of lovely beaches to offer from long sweeps of golden sand to tiny pebbled bays and coves. What they all have in common is crystal clear water and little or no tide. There are some wonderful little hidden inlets for those that explore, particularly by boat and other long tree lined sweeps of white pebbles with water-sports, sun-loungers and the ever enticing turquoise sea perfect for swimming & snorkeling. Off the beaten track, further South of Alaties, is a little bay of sand and shingle with a taverna which opens in high season. It is quite a long and winding road down to Aghia Jerusalem through lovely villages of crumbling Venetian houses which were not completely destroyed by the 1953 earthquake. This beach is not very well known and is a romantic spot to watch the sunset. Agios Thomas consists of two sandy beaches which are the nearest beaches from the village of Karavados. The first beach is a small sandy beach located just below the tavern where the road stops. A secluded bay on the south coast, close to the village of Svoronata, Ai Helis has unusual soft grey sand and shallow waters. Enclosed by steep imposing rocks it is safe for children and popular with families. Facilities include sunbeds, umbrellas and a cantina. A popular beach for sports, organised volley ball tournaments take place in high season. Access is via a long steep track or steps. There is free parking nearby. A short drive from the Manganos crossroads, this tiny sandy beach is surrounded by smooth rock platforms on which to sunbathe. There are rock pools in the area where salt remains after evaporation of the seawater. The beach is reached by some steps below the taverna and you will find a couple of changing rooms which are quite useful as the beach is quite small. Ammes is located in the south-west part of the island, in the area of Svoronata, a couple of kilometres from the capital of Kefalonia. The area is situated a few minutes from the island's airport but is peaceful and full of verdant vegetation. The village of Svoronata is located a couple of kilometres from here and offers tavernas and cafes. The nice sandy beach of Ammes is surrounded by many accommodations and offers a snack-bar. Antisamos beach is one of the best beaches of Kefalonia and is located nearby to the village of Sami, 14 miles from the capital of the island. It is a beautiful and attractive pebble beach with turquoise waters, surrounded by impressive verdant hills. Thousands of visitors are attracted every summer by the natural beauty of the place. Antisamos Beach also offers a snack bar. A long sandy south facing beach Avithos has fine golden sand and clear waters. A short drive from Svoronata, Avithos is popular with couples, families and turtles. There is a cantina, sunbeds, umbrellas and two tavernas nearby. Surrounded by impressive grassy cliffs access is via a steep road and steps. There is a small parking area. A secluded pebble beach, accessible by walking through a short gorge at the end of the village of Old Antipata and is also frequented by motor boats visiting from Fiskardo. Emblisi is a pebbly beach set in a small bay very close to the fishing village of Fiskardo. There is plenty of parking and a snack bar making it a popular beach with families. A deep inlet on the east coast, only a five minutes drive from Fiskardo towards Tselentata. A pretty bay surrounded by olive and pine trees, with a taverna on the opposite side of the road. The small resort of Katelios has a narrow strip of sandy beach which widens as it extends towards the southern headland. It is kept clean and well maintained during the summer months. There are generally sunbeds and umbrellas available to hire. Additional shade is provided by the large waterfront trees and the selection of beach bars and tavernas which line the road directly behind the beach. Lourdas has a long white coarse sand and pebble beach and is one of the most beautiful beaches of Kefalonia due to its crystalline water. It offers sun beds, umbrellas, taverns and a few shops. The surroundings are wonderful and Mount Ainos can be seen towering in the background. Makris Yialos is located near Argostoli. This is a very good beach for sunbathing with a larger beach that can get very busy and has a fenced off area for sunloungers. There is also a good beach bar, a couple of good restaurants serving traditional Greek food, and watersports facilities available. From the village of Ratzakli, take the road down to the long sandy beaches of Potamakia and Kaminia with warm shallow water. The bay at Mounda stretches for miles out towards Cape Mounda and it is here that the caretta caretta turtles return from great distances to lay their eggs. Learn the Turtle Code before visiting this beach and if you bring your own beach umbrella, make sure you use it as near to the shoreline as possible so as not to disturbany turtle's nests. The water is usually warm here and it is so shallow that it is quite a walk out to just get in past your knees. There is a small cantina with sun beds for hire. Great for families. Myrtos beach is the trademark of Kefalonia Island and is considered as one of the most beautiful beaches of the entire Ionian Islands. Located north of Argostoli (the island's capital), this impressive beach has a fine golden sand and wonderful turquoise waters, the whole place is surrounded by impressive and majestic vertical rocky cliffs. This pure paradise is one of the most photographed places in Greece and attracts thousands of visitors every summer. A snack-bar, sun beds and umbrella rentals are available on the beach. There is a port at Pessada but this is well away around the headland and does not affect either of these two lovely bays. Park up near the road (there is little carpark to speak of) you walk down some nicely carved stone steps amid a riot of greenery. At the bottom there is a lovely little bay, with soft sand and clear water with plenty of rocks dotted about in the bay. To the right there is another even nicer bay just around the headland. Skala beach is dramatic, with several kilometres of soft, white sand. The resort and village are well maintained and clean and the beach cleaned regularly during the summer. Skala beach is a busy resort with a wide range of tavernas, shops, swimming pools, fairly quiet bars and the usual range of tourist amenities. The sheltered bay of Spartia is situated at the bottom of a flowery hillside and is protected by large outcrops of rock. Spartia beach is made up of fine sand, coming from the limestone cliffs behind and is very popular in high season. To the left of the beach is a small jetty and harbour where local fishermen moor their small boats. Above the beach are a couple of tavernas. Large turtles can often be seen swimming in the bay. Trapezaki beach is clean, with a taverna serving lunches. It is divided into two sections, with sunbeds and umbrellas available to rent in the high season. As the sand shelves gently it is great for families with small children. The Greek menu contains something for everyone. Famous for their selection of smaller plates that comprise a whole meal (rather than the typical 3 courses), Greek food may share a similar palate to Italian, but the style of the cooking is rather different. 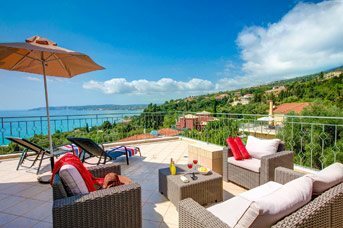 Kefalonia is just one of the idyllic Greek islands that sit in the Ionian Sea, and as such it is a great place to sample fresh sea food, but it is also a place that's known for rearing fantastic meat. 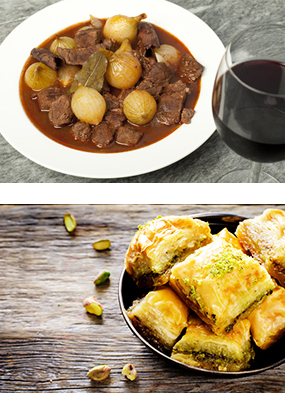 Both are sold fresh in local markets and in the island's restaurants, or tavernas and estiatorios. Fresh food and the enjoyment of it makes up a large part of the Greek culture. Eating is a social activity, and meals out are relaxed, tasty affairs. For eating outside of the local taverna, Kefalonia is a dream location for those on the hunt for entirely local produce. Though many of the shops on the quaint, upmarket streets of Fiskardo town have their colourful doors thrown wide and may feel a bit market-like, more traditional, large produce markets take place in Argostoli. Down by the harbour, you'll find fish, meat, fruit and vegetables for sale.You'll also find many highly recommended restaurants in Argostoli, a firm favourite for all food lovers visiting Kefalonia, and you can find out more in our Kefalonia resort guide. As an island, Kefalonia loves seafood. Whilst the food is not spicy, it still has the taste of the Mediterranean thanks to the range of spices that are frequently used in Greek dishes, but the flavours are typically full and rich as Kefalonians still embrace the one-pot dish style of slow cooking. Sofrito- Kefalonian dishes include Sofrito, which is veal that's been cooked in wine, herbs, garlic and vinegar which is then reduced to a thick sauce. 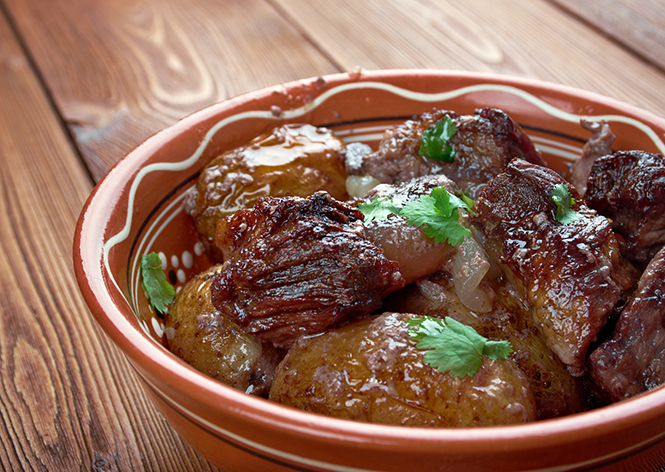 Stifado- a common favourite on the island. A rich, meaty stew that is usually made with dark meat like beef, rabbit or lamb. Moussaka- Kefalonian cuisine isn't solely slow-cooked though. Lamb, or Arni, that's marinated in olive oil and lemon juice, grilled and served on skewers is always popular, as is the Greek staple of Moussaka, where lamb, aubergines and tomatoes are layered in a dish and topped with a cheese sauce before being baked. The cheese used is typically Keftalotiri,a Greek hard cheese not too dissimilar to Parmesan. Baklava- Like that of many Mediterranean countries, Greek cuisine doesn't focus too heavily on the dessert part of the meal. That being said, be sure to try the baklava should you get the chance, as the light but crunchy layers of nuts and pastry also ooze with honey – often locally sourced – and create an incredible sweet treat. Pre-heat the oven to 160°C (325°F). Pour the red wine into a bowl with the coriander and bay leaves, then add the pork. Leave in the fridge to marinate for at least 3 or 4 hours, stirring once or twice - overnight is better if you can prepare ahead of time. Heat the olive oil in a large pan before draining the meat, saving the marinade. Fry the pork on all sides until it is nicely browned, but not cooked through, then transfer the pork to a casserole dish. Fry the onions until soft and translucent and add these to the dish too. Pour over the remaining marinade and add cinnamon, salt and pepper. Give it a stir and pop it in the preheated oven for an hour, until the meat is falling apart. Serve with rice and salad.